Denying it won't make you return to ordinary. The concept for this world was really interesting, but I thought it could have been executed better. I mean, you get to become a magician if you go to this particular school and get an apprenticeship of which magic you want to learn! How exciting! Well, Ceony Twill did NOT get to choose herself which magic she got to learn because there wasn't enough Paper Magicians, but she gets the 'exciting' part none the less. Whyyy you say, since Paper is well known as one of the most boring Magic? Because EMERY THANE. DUN DUN DUUUN!! You gotta love Emery Thane. Emery Thane is Ceony's new teacher! And quite an odd one at that. It must be a new trend to make teachers/bosses very kooky. (See Jackaby .. Kind of similar.) I don't really mind this unless the weirdness is too unbelievably fake :D It's interesting to see how the term 'unique' crosses over between different authors. Back to the 'could have been executed better' part. The plotline was kind of.. bare. I know she somehow went literally 'into' his heart and all that (read the synopsis), but that was it? Uhh very interesting... XD The beginning was really cool; we saw Emery's character and got to know Ceony better, and then the middle just seemed to draaaggg onnnnn. The romance was barely there that you wouldn't even realise there was any. (Apart from the ending thing that happened) Ceony's feelings seemed to have developed too fast to be believable, if you add on to the fact that Ceony is like 19, only been in one relationship before, and Emery was 30 something- having been married and divorced once. Ooookay then. I would have liked to see her feelings develop. Why didn't we, since we've been in her head ever since she even saw Emery? Hmmm. Three months after returning Magician Emery Thane’s heart to his body, Ceony Twill is well on her way to becoming a Folder. Unfortunately, not all of Ceony’s thoughts have been focused on paper magic. Though she was promised romance by a fortuity box, Ceony still hasn’t broken the teacher-student barrier with Emery, despite their growing closeness. 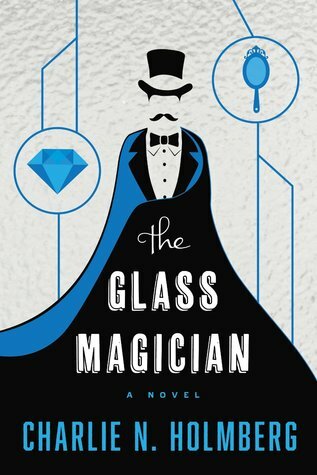 When a magician with a penchant for revenge believes that Ceony possesses a secret, he vows to discover it…even if it tears apart the very fabric of their magical world. After a series of attacks target Ceony and catch those she holds most dear in the crossfire, Ceony knows she must find the true limits of her powers…and keep her knowledge from falling into wayward hands. 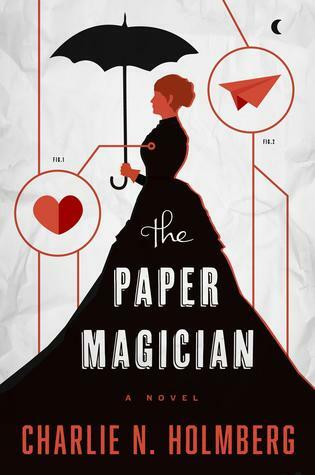 The delightful sequel to Charlie N. Holmberg’s The Paper Magician, The Glass Magician will charm readers young and old alike. So I read the sequel! Yeyyy xD This was definitely more fast paced and fun than the first book. But of course, it had problems of it's own. Since this one was not about Ceony running around by herself in Emery's heart, it had much more dialogue and many new characters. Problematically..... the new characters had no depth. Or any characters, for that matter... :/ The fact that Ceony had no, well, dimension shined through in this book much more than the previous novel since there were more important events that included decision making. She would think the same things over and over again without any real reasoning behind it, and it seemed like the author had this go-to character quality checklist next to her and was like "Ceony- Loyal, Heroic, Sacrificial" *adds random loyal, heroic, sacrificial scenes into book* Same went with Lira in the previous one, the newly introduced Delilah as with the new antagonists. Not much background information on any of them either. Ceony was kind of annoying here toooo. Oh, she defeated Lira! Now ALL the consequences are HER fault, therefore she must go and fix everything herself in secret! Even if it means danger to everyone around her! and then she gets all upset when people try to fix her mistakes without her, like 'I should be there!! Why?!?" Well maybe it's because you caused them to gather in the first place *facepalm* It was alright in the end, I suppose, since her attempts to fix humanity often gave out useful information. But still. Did I mention she was kind of racist too? Like right after the mill explodes and everything's chaotic, she sees this Indian dude standing across the street and she's like 'Oh look, a dark skinned man! How suspicious! Maybe HE blew the mill up! Oh dear I shouldn't think that.' And then of course in the later chapters, still, she doesn't say much about him apart from his accent and his skin tone. Wth? The parts about women and cooking annoyed me as well, since from personal experience, I know all women can't cook. *cough cough not naming names* xD Just.. meh. Again, I'm afraid I don't have much definite thoughts on this one. I liked the increase of action, but the characters were flimsy as paper (see what I did there), and there are no points worth talking about. Sorryy. If it wasn't short as it was, I can't say I would have finished the books.